Even though Monae has always pulled from the past, she's found the perfect balance of old and new, paying homage to iconic black music with grace, style, and reverence. 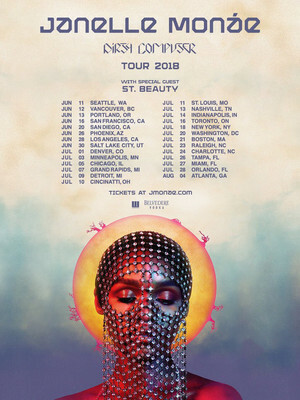 Hot on the heels of the long awaited 2018 release of her third studio album Dirty Computer, groundbreaking retro RnB goddess Janelle Monae is hitting the road this Summer, bringing special guests St. Beauty along for the ride. The six-time Grammy nominated singer songwriter, producer and rapper first broke the modern pop mold with her bold debut The ArchAndroid, a concept album that blended afro-futurism, killer hooks and a sci-fi aesthetic. Capturing the essence of sensual neo-soul funk stylings of Prince in his prime, as well as the watertight songwriting of Stevie Wonder, Lauryn Hill and Michael Jackson, Monae's latest musical rebirth sees the artist take on the patriarchy in her lyrical content, championing the feminine form and celebrating what it means to be queer, black and feminist in today's mixed up world. Known for her theatrical live shows filled to the rafters with electric anthems and a rhythm section tighter than lycra jumpsuit this powerhouse performer is not to be missed. Seen Janelle Monae? Loved it? Hated it? Sound good to you? 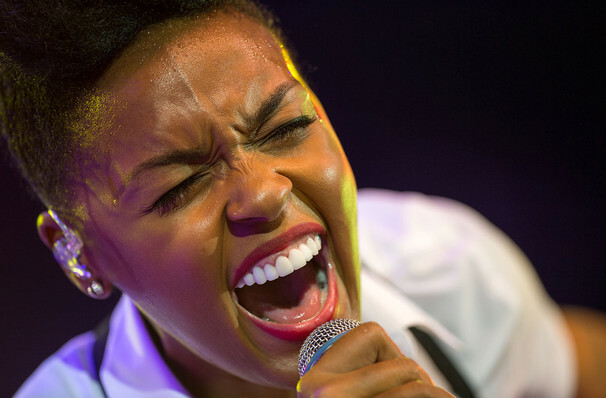 Share this page on social media and let your friends know about Janelle Monae at The Chicago Theatre. This is an independent website not affiliated with the venue. 'The Chicago Theatre' as well as all associated graphics, logos, and/or other trademarks, tradenames or copyrights are the property of MSG CHICAGO, LLC and are used herein for factual descriptive purposes only. This website is in no way associated with or authorized by MSG CHICAGO, LLC and neither that entity nor any of its affiliates have licensed or endorsed us to sell tickets, goods and or services in conjunction with their events. The term Janelle Monae as well as all associated graphics, logos, and/or other trademarks, tradenames or copyrights are the property of Janelle Monae and are used herein for factual descriptive purposes only. We are in no way associated with or authorized by Janelle Monae and neither that entity nor any of its affiliates have licensed or endorsed us to sell tickets, goods and or services in conjunction with their events.